U.S. stock markets are sitting near record levels and investors might just push them into new territory Thursday. 1. More record highs? 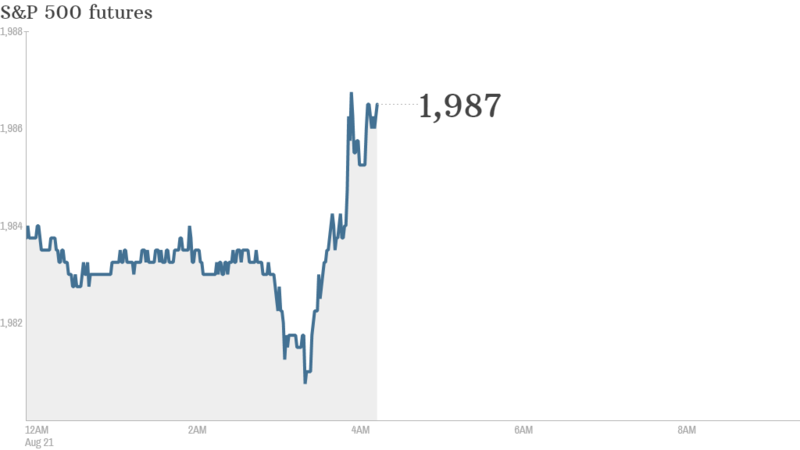 U.S. stock futures were edging higher and European markets were gaining ground in early trading. Manufacturing data in China provided a negative surprise, but preliminary August purchasing managers' surveys in Europe were slightly better than expected. Asian markets were mixed. The S&P 500 is within spitting distance of the intraday high set on July 24 when it touched 1991.39. The Dow Jones Industrial Average is also not too far from its record high of 17138.20, which it hit in mid-July. The CNNMoney Fear & Greed index shows investors becoming less fearful. 2. Central bankers: Markets are waiting for the start of the Jackson Hole Economic Policy Symposium, which kicks off later today. The annual event brings together central bankers, policy experts and academics to discuss important economic issues, and this year's focus will be on labor market trends. Federal Reserve Chair Janet Yellen delivers her keynote speech Friday. Any surprise statements by the Fed chair tend to move markets dramatically as people reset their expectations for interest rates and monetary policy. 3. UPS data breach: Watch shares in UPS (UPS) Thursday after the company reported a data breach at 51 of its U.S. stores. The delivery company said customers' names, postal addresses, email addresses and payment card information may have been compromised between January and August. UPS said it was alerted to the data breach by government sources, along with "many other U.S. retailers." 4. Expect earnings and economic data: Dollar Tree (DLTR) and Hormel Foods (HRL), the maker of Spam, will report earnings before the opening bell. Salesforce (CRM) and Intuit (INTU) will report after the close, as well as retailers Aeropostale (ARO), Gap (GPS) and New York & Co (NWY). The U.S. government will report weekly jobless claims at 8:30 a.m. ET. Data on existing home sales in July will be posted at 10 a.m. ET. 5. Wednesday market recap: U.S. stocks closed mixed Wednesday. The Dow Jones Industrial Average gained 60 points and the S&P 500 closed 0.3% higher. The Nasdaq finished just about where it started, ever so slightly in the red.